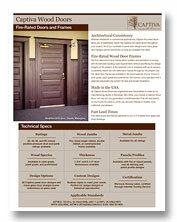 Get inspired with our Captiva Wood Door Brochure, which includes door designs, frame systems, hardware and more. Door construction, unless specified differently shall include a stave core method that uses a laminated stable wood core sandwiched between veneers. Captiva Traditional Doors use 1/4″ solid veneers on all stiles and rails with matching edges to help prevent warp or distortion. 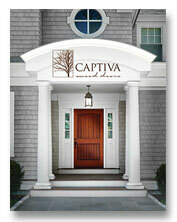 Captiva Select Doors use laminated stable wood cores sandwiched between 1/8″ veneers. A unique “beaded tenon” inserted by hand is used instead of dowels creating a similar mortise and tenon connection on all stiles and rails. All raised panels used in both methods shall be manufactured using double panel technology, which virtually eliminates cracking panels by allowing independent movement. Both types of construction are time tested methods and backed by our full warranties. Multi-lite doors, as true divided lite (TDL), available in Captiva Traditional or Select, with 1/8″ single pane, 5/8″ IG glass, or 5/8″ Low E glass and wood stops applied to the exterior. Muntin bar widths are 1″, 1-1/8″, and 1-3/8″. Simulated divided light (SDL) with 7/8″ SDL bar, and 11/16″ duplex muntins. Wood bars applied to both faces of door with the loose stop toward the exterior. SDL is available in Captiva Select doors only. 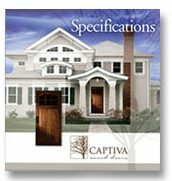 Download the full Captiva Door Spec Book, containing over 450 pages of door styles and drawings; or see individual spec sheets below for glass, species or construction details. Access our library of doors and over 5,000 custom moulding profiles online at nacdrawings.com. Don’t see what you need? We can create your custom profile from sample or a sketch. 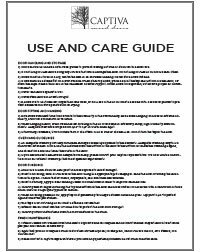 Both DWG and PDF files available online. 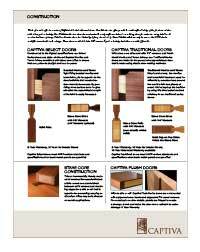 Captiva Wood Doors warrants to the original purchaser of an interior Captiva Wood Door that the product shall be free from defects in material and workmanship. The warranty period shall commence on the date of delivery. Should the product fail to conform to this warranty within the warranty period, Captiva Doors will, at its option, (i) repair the product, (ii) replace the product in its original state of purchase, or (iii) refund the price originally paid to Captiva for the product. Damage caused by failure to comply with the instructions in the Captiva Door Use & Care Guide. Any door that is over 42″ in width and/or 96″ in height. claim, as the warp may prove temporary as the door adjusts to weather conditions. 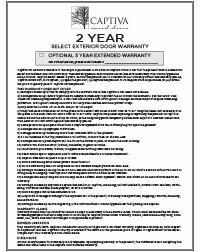 This deferral will not count against the warranty period. Damage caused by anyone other than a Captiva representative while attempting to repair the product. Damage caused by trimming more than one inch total of the product. Doors trimmed at the top, more than 1″ at bottom, or more than ¼” at each side. Damage caused by nonalignment or bow in the frame or jamb in which the door is hung. Natural variations in color, texture, character, or grain of wood. Variations in gloss level, texture, or appearance resulting from field finishing. Panel shrinkage or expansion due to natural characteristics of wood movement. Gaps in stile and rail joints of 1/16″ or less. Doors containing dual wood species of face veneers and/or planks on each side. Damage caused by failing to seal all six sides and hardware cutouts of the door. Doors must be sealed within 72 hours of fitting and/or hanging. abuse/neglect, or acts of nature. Doors shipped out of the continental US. Any costs or charges relating to the replacement of the product, including transportation, shipping, removal, finishing, and installation. Damage caused by failure of glazing, if the manufacturer’s warranty period for that glazing has expired. Warranty claims must be submitted within 30 days of discovery of the believed issue. 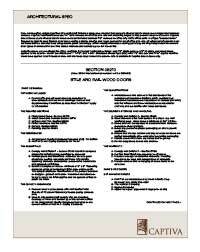 Claims must be submitted via email to techsupport@northatlanticcorp.com or in writing to Captiva Wood Doors Warranty Claims, 1255 Grand Army Hwy, Somerset, MA, 02726 and must include proof of purchase of product. This warranty sets forth Captiva’s maximum liability for its products. No other warranty, expressed or implied, with respect to its product is made. Captiva’s liability is limited to the refund of the purchase price or repair or replacement of the defective product. This warranty is non-transferable. Formal acceptance of this warranty is not required. By accepting delivery of the product, the customer is also accepting the terms and conditions of the Captiva Doors limited warranty. 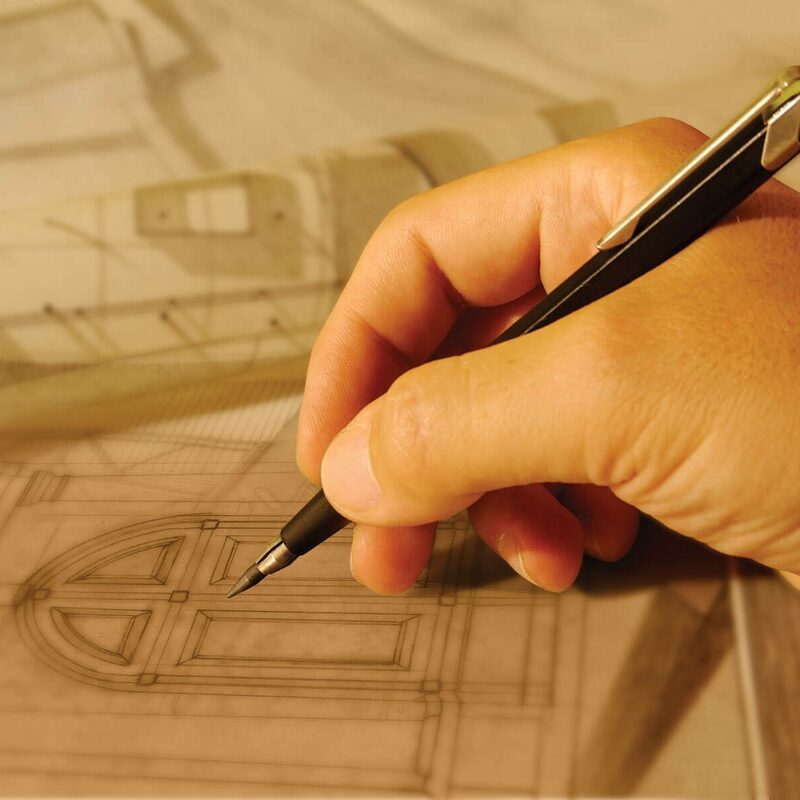 Captiva Wood Doors warrants to the original purchaser of an exterior Captiva Wood Door that the product shall be free from defects in material and workmanship. The warranty period shall commence on the date of delivery. *Extended warranty period is available. See Extended Warranty documentation for details. help stabilize the door and prevent warp. Doors containing solid wood panels wider than 14″. The tops of all outswing doors must be flashed for weather. Damage caused by temperature buildup where a storm door is present. Screen and storm doors are not covered under warranty. 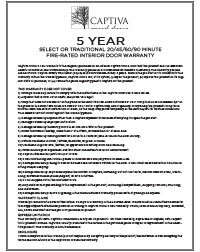 5 YEAR EXTENDED WARRANTY – Available on CAPTIVA Select DOORS only. The 5 Year option must be requested at the time of quoting/ordering the door unit. The extended warranty if requested is offered at an additional cost. The warranty described above is extended for a period of 10 (ten) years with the additional requirement of adding multipoint locking hardware, such as Trilennium, that provides a minimum of three latching points on the lock edge or top and bottom of the door. The 10 Year option must be requested at the time of quoting/ordering the door unit. The extended warranty if requested is offered at an additional cost. No Overhang 10 Year Warranty. Warranty must be requested at time of quoting/ordering. Certain restrictions apply in addition to standard warranty terms. Doors should be handled with clean gloves to prevent leaving dirt and oil stains on the door face. Do not drag or slide doors along any surface that could damage the door. Do not drag or slide doors across each other. Doors must be stored in a dry, ventilated area in an enclosed building. Never store doors outside. Doors should be stored flat on a level surface. When stacking doors, place a 2×4 at the top and bottom of each door, 12″ from the edge. Place a third 2×4 in the middle for a center support. Cover doors to keep clean, but ensure proper air circulation exists. Never lean doors against a wall. Never store doors in direct sunlight. If doors are to be stored for longer than one week, all six sides of the doors must be sealed with a non-water based sealer or primer to prevent excessive moisture penetration or drying. Give doors sufficient time to acclimate to the humidity of the surrounding area before hanging. In areas of extreme humidity, allow for a minimum of 72 hours. When hanging a door, allow clearance for swelling of the door or frame in extremely damp, high humidity environments. 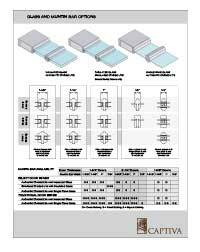 Adequate clearance ranges from 1/16″ to 1/8″ in width and height. If trimming is needed, trim no more than 1″ at bottom of door and ¼” at each side. Do not trim the top of the door. An adequate overhang will help minimize damage caused by exposure to the elements. 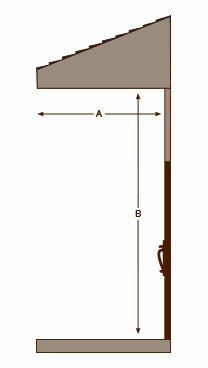 Adequate overhang length is a minimum extension of one-half the distance from the bottom of the door to the bottom of where the overhang begins, and at least one and half times the width of the door. Captiva representative. We offer limited warranties for doors without overhangs that meet specific requirements. 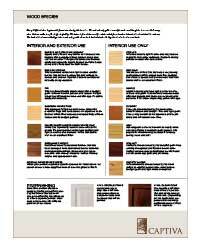 Avoid use of dark stains or dark paint in areas exposed to direct sunlight. Prior to finishing, sand all surfaces of the door using the appropriate grit sandpaper. Sand the door following the direction of the grain. Ensure that all marks, fingerprints, and scratches are removed. Prior to staining, apply a clear sanding sealer or conditioner in order to improve finished look. Carefully seal all edges including the top and bottom of the door and areas routed for hardware with a minimum of three finish coats of a high quality paint or varnish. When finishing glazed doors, apply top coat generously to bridge between wood and glass. Lap paint 1/16″ to protect against moisture penetration. Exterior sealers must contain UV inhibitors to protect the door from sunlight. Carefully follow instructions from the manufacturer of the finish. Exterior sealers will weaken over time due to exposure and will require annual maintenance. Inspect door at least once per year and refinish as necessary. Signs that your door requires finish restoration include dryness, raised grain, minor surface checks, dark streaks, or a whitish cast. Please contact a Captiva representative if you have any questions/concerns about finish maintenance. Maintain your finish with Klima’s Aquatech Retoning Liquid (TN030), available from your sales rep.
Dimension A (length of overhang) must be equal to or greater than ½ of dimension B (distance from bottom of door to the base of the overhang). Warranty must be requested at time of quoting/ordering. Certain restrictions apply in addition to standard warranty terms.